Please note: The ring in the photos is sold. As each diamond is unique in its raw, uncut form, the photos are used to give you an idea of how your ring can appear when built. 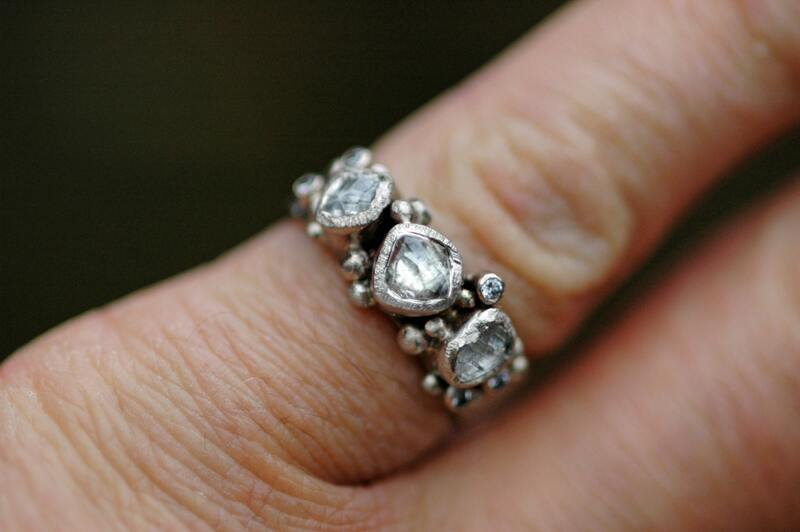 The ring in the photos is constructed of 14k white gold. 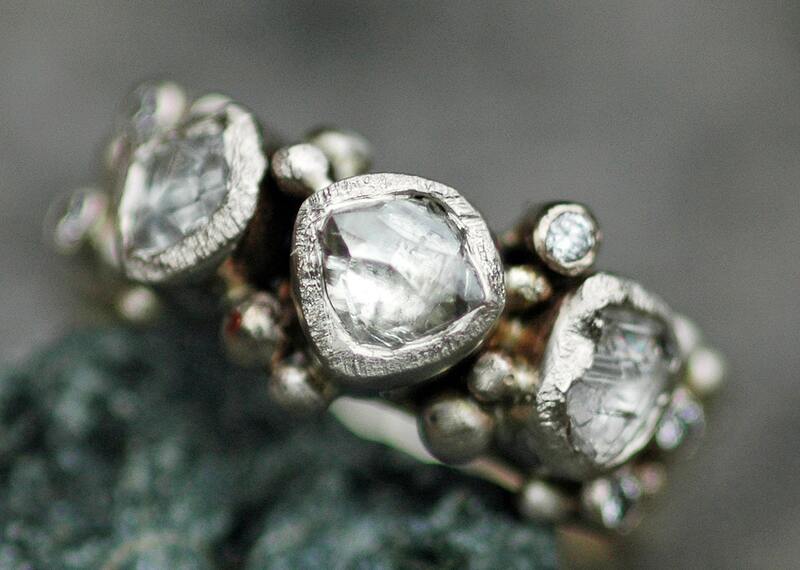 This ring is custom-designed for you, around three uncut, raw diamonds. All of my diamonds are certified conflict-free, and comply by UN Kimberley Process protocols. These diamonds are gem-grade stones. The smaller, flanking diamonds are graded as VVS/VS by the two diamond brokers from whom I purchase this quality of stone. The size, colour, and clarity of the centre stone will depend upon personal preference, and can affect the price of this ring. 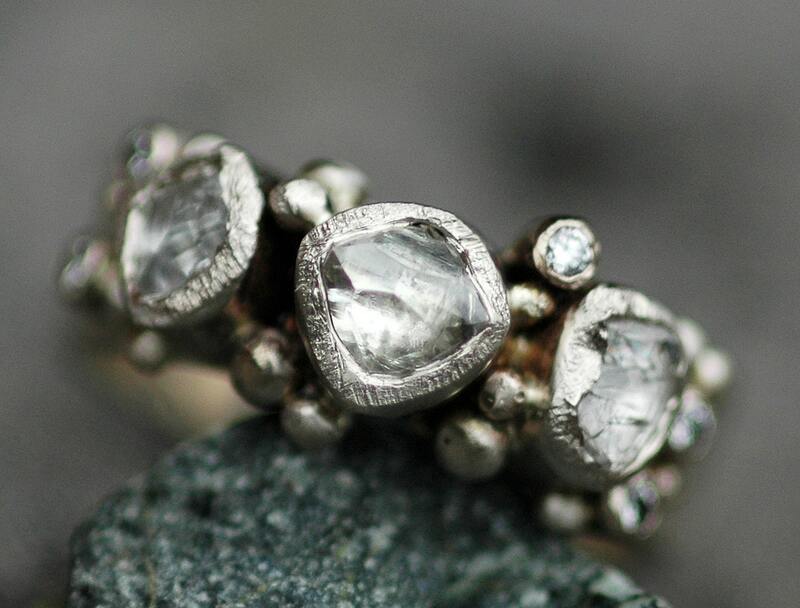 The flanking stones in this ring are around 3.5-4mm across, and are naturally-occurring dodecahedron crystal formations. These are uncut stones, and they formed this way billions of years ago, deep within the earth's crust. The centrepiece diamond in this ring is approximately 5-6mm in length. Again, these stones are in their natural, raw, uncut form. Larger centre stones are available upon request- please get in touch for a cost estimate on your perfect diamond. 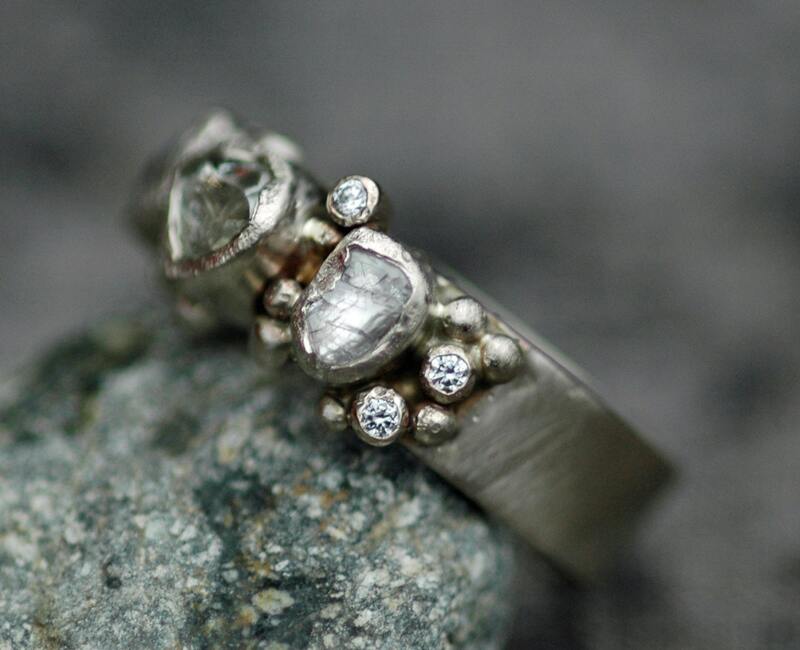 My stones come from two reputable diamond dealers, and are certified conflict-free. 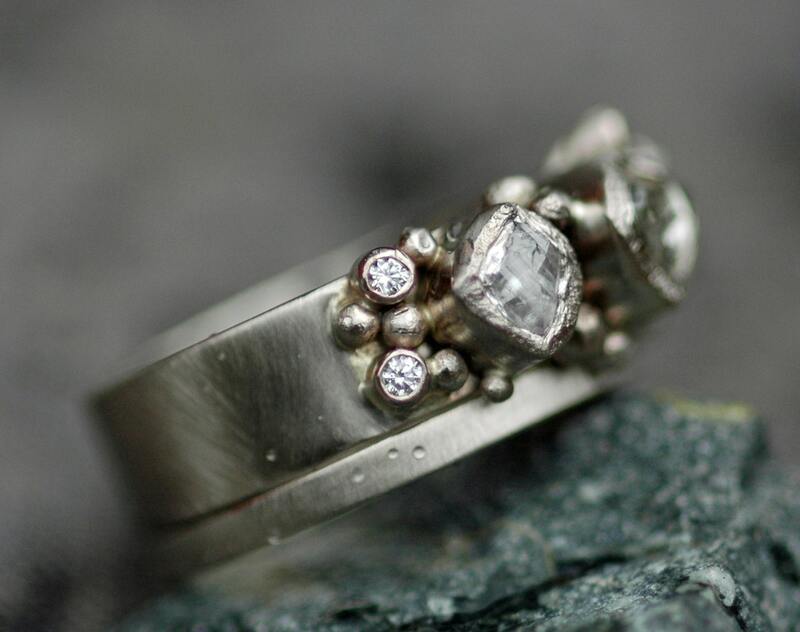 The ring you see here has a brushed texture, and a 6 x 1mm rectangular profile ring band. Around the stones is a series of gold granulation/metal balls. Also scattered about the main diamonds are 1.7mm VS quality white brilliant cut diamonds. These tiny cut stones really sparkle and shimmer in a way I cannot capture with my camera. It was beginning to rain as I took the photos- you may see some Vancouver raindrops on the ring bands. The bezels around the three main stones have been given a textural edge, in keeping with the natural surface texture of the diamonds. I can create a smooth, polished lip on your bezels if you prefer. You will have the opportunity to select your centre stone from photos provided by my dealer. I do have a few of these stones in stock, but always work closely with my dealers to ensure you get the exact stone you are looking for. Each of these rings is as unique in appearance as the chosen diamonds, and the unique customizations you choose for your design.